I spent the better part of today making a cake for my 4-year-old’s birthday. Not just a one-pan-and-frosting kind of cake. Nope. A “rainbow cake” which, you guessed it – includes EVERY color of the rainbow. This project requires many bowls, and six layers mean six pans. (Really, three pans twice – because who has six round pans?) However it adds up, a lot of mess is involved in this one cake. In many ways, it’s crazy-making considering how easily I could pick up some cupcakes or cookies; which would be entirely appropriate for a 4-year-old’s birthday. Where let’s face it, a bunch of keyed-up preschoolers will sit just long enough to shove maybe three bites of frosting into their mouths – getting most of it on their face and cute party outfits – before they begin running around the room and bouncing off walls. b) I’m a “Pinterest Mom” and this is another notch in my crafty, gingham apron strings. c) I’m a masochist (and a martyr) who takes on insurmountable obligations and projects in excess. These theories aren’t entirely baseless. At one point or another, I’ve been one, the other, or all three – at once. Today, I’m a mom who feels so much is out of my control when it comes to the current task at hand: Raising my kids. Every day is unpredictable and I’m kept on my toes a lot. My balancing act leaves tons to be desired. Most days, I eek by with a C. (On good days a solid B.) I yell. I lose my patience. I have even on occasion (Gasp! ), resented my children. I’ve wanted to disappear out the front door and transform into the me of decades past. I'd hop into my green convertible, leaving their always-in-need-of-something little bodies behind, and zip off to get sangria with the boyfriend I was crazy about – who, by the way, is the same man I’m married to – even though sometimes, sadly, I forget. But I love those needy little monsters, so in lieu of convertibles and fruity wine I occasionally seek out closed-end tasks for sanity’s sake. Like baking fancy birthday cakes. Somewhere in this buttercream frosting and R-O-Y-G-B-I-V is another year of my kid’s life gone by, another year of me being a mom, and a million things that both did and didn’t go well. Like the frosting on this cake – depending on where I stand, how the light hits, or the angle of my gaze – I can see it as perfect, or I can see all the flaws. The amount of care taken in adding each new candle to the cake is overwhelming. Fevers, X-rays, tears shed, tantrums thrown, doors slammed, knees skinned, pets lost (OK, they were tiny frogs, but the amount of sadness expressed rivaled me watching “E.T.,” so our dogs better live at least another 65 years). All of this, and So. Many. Band-Aids. Twelve months marked by countless nose kisses given, lazy-morning banana pancakes made, kites flown, rainy-day-book-forts built, puddles stomped, popsicles licked, and fears conquered. The unbridled and euphoric laughter of childhood filled hallways as fresh pencil lines on doorjambs proclaimed a newer, taller version had replaced last year’s model. So much life in a year. The possibilities of how these little lives might shake out over time make my head spin with equal parts hope and fear. 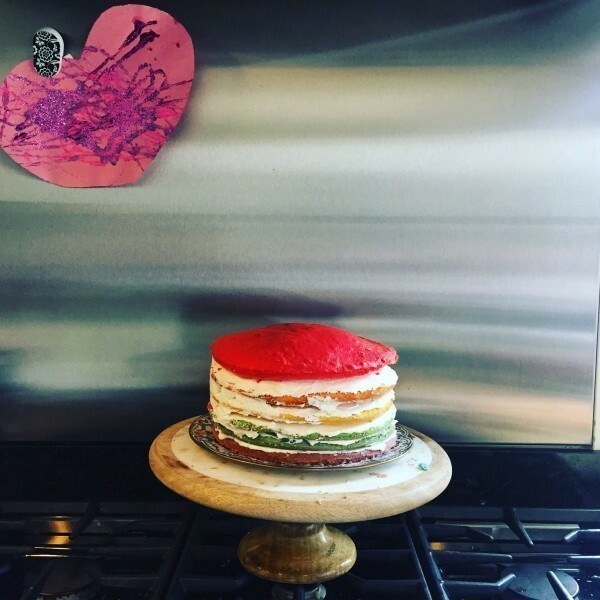 Bookmarked in my mind is an image of my older son, exuberant when we made his rainbow cake six years ago (before I’d met the indifference of tweenhood), – proof he’s in there somewhere – and that favoritecolorrainbow is genetic. Today for a minute we all overlapped, in front of the round pans and the pre-heated oven, like déjà vu. In this frenetic life that so easily pulls us all in a million different directions, I need to touch hands with these memories as a reminder of the life I intended, before becoming so wildly distracted with the life I am actually living. Maybe by making this cake, I can do other things I already did right once. If I intentionally thread pieces of the past into us as we move forward, perhaps somehow we’ll get through this growing up thing intact. Even (I dare to hope with crossed fingers), the frosty throes of adolescence. Maybe these layers will remind my children that we are unconditional. As a parent, it’s easy to remember the times I fall short. I need to remember the times I showed up, had patience, and dove in with my whole heart. The times I read the extra bedtime story, hugged a little longer, and played Candyland 17 times in a row. I need to remember the days I was the best version of me: Making magic out of cake mix. I don’t know what the future holds, so I’ll take stock of what is sure. This memory is mine to keep. And as we journey together toward One Candle Older, I’ll fold down the corner on this day to visit again. A time when mixing birthday batter into rainbows – and the joyful face of a little boy who has his whole life ahead of him – is all I need. And for reasons maybe only I understand, right now, this cake is everything. Jacque lives in California with her two boys (lively), two dogs (rescues), one cat (indifferent), and her husband (patient). She is currently working on a memoir. 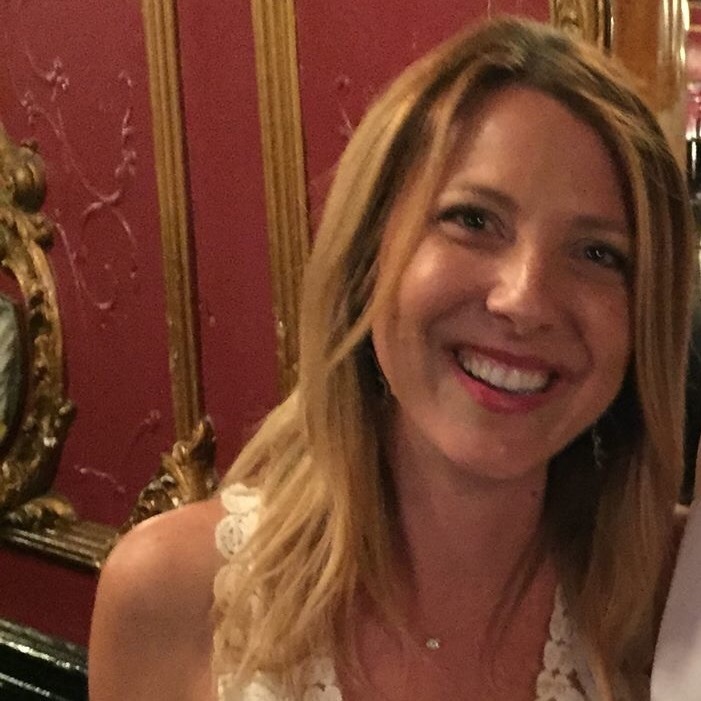 Her writing can be found on The Washington Post, Scary Mommy, Popsugar, HuffPost, and more. You can also find her at her blog, writewhereiam and on Facebook and Twitter. This post originally appeared on my blog, and was featured on The Huffington Post. Jacque is a mother of two boys. When she's not chasing children and crossing off to-do lists, she can be found consuming large amounts of caffeine, or hiding from her kids, writing. Her work has appeared on Popsugar, Scary Mommy, HuffPost and more. You can also find her at writewhereiam.